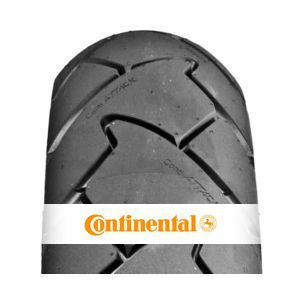 The Continental ContiTrailAttack 2 is a motorcycle tyre developed for trail riding. Thanks to its “Continuous Compound” technology (rubber compound that improves grip under all conditions), it offers an excellent grip both on wet and dry pavement. Optimum stability. Expensive but lasts well and suits KTM adventure bikes well as OE fitting, Dry road grip excellent and stable, but not quite as reassuring on wet roads as Metzeler Tourances, although lasts better. Expect about 6-7000 miles before profile squares off. A great tyre for my daily 100 mile commute. Never had a problem in the wet and sticks very well in the dry. 7k miles and I have just ordered a new rear. To review the Continental ContiTrailAttack 2, you first have to log-in by clicking here.